As many Mineral Pointers know, our town is the place “Where Wisconsin Began.” Specifically, Wisconsin began on High Street. As part of the refurbishment of Library Park, the sign was recently removed and touched up by John Sharp. 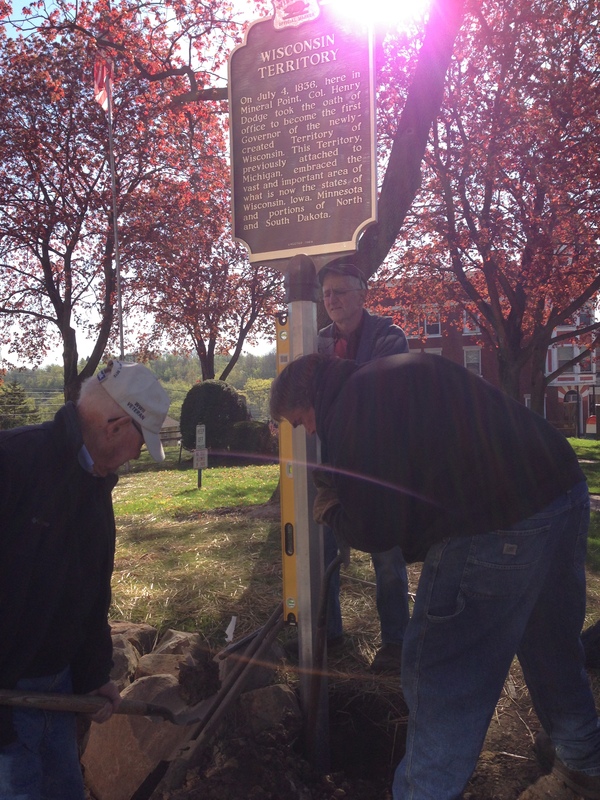 Early Monday morning, John, Jim Bennett and Don Hawkins re-installed the sign. Don Hawkins remembers when the sign was first installed almost 50 years ago. So, next time you’re walking down High Street at Library Park, take a moment to read the sign and stand in the spot Where Wisconsin Began. This entry was posted in History, Outdoors, People and tagged 1836, Don Hawkins, Governor Dodge, Jim Bennett, John Sharp, Library Park, Mineral Point, Wisconsin, Wisconsin Territory. Bookmark the permalink.